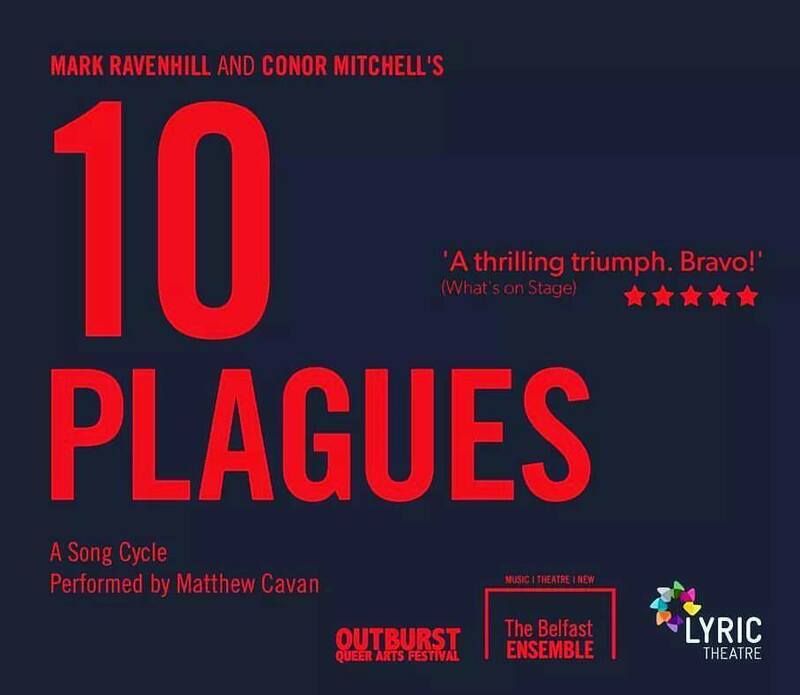 First performed in 2011, Mark Ravenhill and Conor Mitchell’s song cycle Ten Plagues was performed in the Lyric Theatre on Sunday evening as part of Outburst Festival. This beautiful collection of songs collectively tell the story of a man living in a plague-ridden city of London, watching the pits of dead bodies grow and wondering how soon he will join them as the death rate increases exponentially. Soloist Matthew Cavan confidently strode onto the stage and sat down. Blue suit, drainpipe trousers, white shirt, a thin red tie that matched his lipstick. With a ghostly white pallor he began to sing over the pattern of descending scales running out of the fingers of composer and pianist Conor Mitchell. The dark set looked like a once glamorous but now abandoned cabaret venue with a shiny painted floor and protruding circular stage covered with dust and glitter. Cavan’s sparkling high heels suggested that parallels could be drawn between the real life seventeenth century plague in London with the hysteria that surrounded the increasing incidence of HIV/AIDS during the late 1980s and early 1990s. Mark Ravenhill’s third song in the cycle saw the nameless narrator realise that “suddenly I need a God” and visit a church to “save us all”. Yet the pulpit was empty and he left, as the song’s title suggests, “Without a Word”. While simple and repetitive, the layered lyrics are heavy with intelligence. 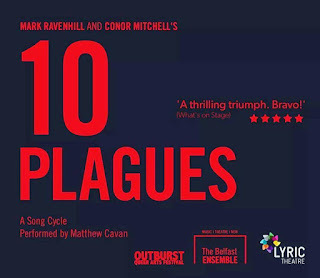 As has become their tradition, Belfast Ensemble’s production of Ten Plagues was a masterclass in restraint and quality. Over recent years, video has threatened to become the curse of theatre. Projections animated a simple screen hung from a the dark arch behind the two performers on the main Lyric Theatre stage. Gavin Peden’s video art enhanced the sense of each scene while never distracting from the art of the song. Lit by three projectors and just three lights, the imagery provided the main illumination and colour, with the carefully choreographed Cavan casting bold shadows onto the screen as if he was in the pictures. As the cycle continued, Mitchell’s movements at the keyboard added to the drama with his flying hands, arched back and gasps for breath. It all subtly amplified the intensity of the cycle as it headed towards its rather spectacular conclusion. The mood swings of depression, fear, hope and death were exquisitely captured in the music and singing. The rasp in Cavan’s voice gave way to a powerful cabaret style that belted out the big numbers with aplomb. Hard to believe that this was his first public performance in the role originally written for Marc Almond. While there was death on stage, I thought I might croak it with a tickly cough, exiting during darkness a few songs from the end to avoid the sharp pin of Mitchell’s voodoo doll he reserves for critics. You can hear more about that in the last part of Radio 4’s Opening Night episode recorded in Belfast last month. Thank goodness for the Lyric’s closed circuit TV and the ability to continue enjoying the performance from the foyer! Ten Plagues delivered a poignant, emotive and overall beautiful performance with a style that seemed simple but belied Belfast Ensemble’s usual complex design and planning. A marvellous one-off production for the Lyric to host, and hopefully an opportunity to rejuvenate interest in Mitchell and Ravenhill’s collaboration. 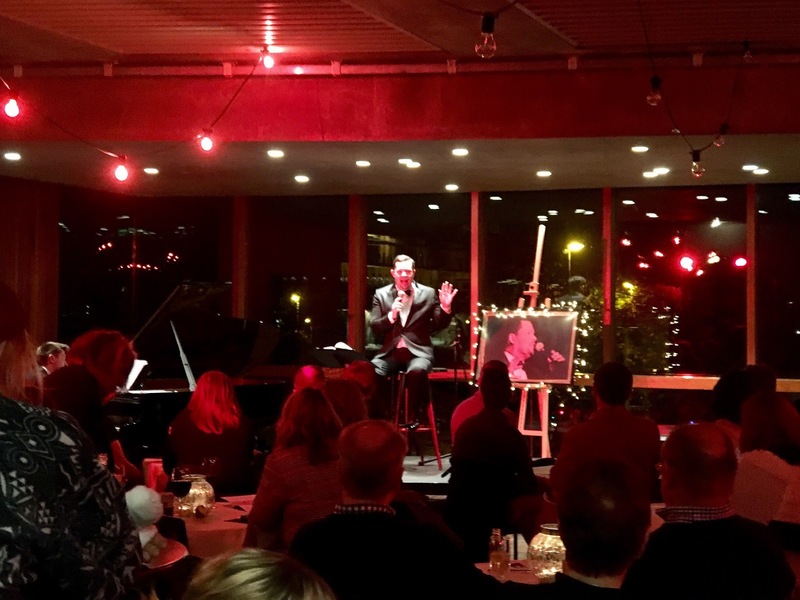 When the theatre cleared, much of the audience retired to the Lyric’s bar for the second act, this time in a more music hall style, picking up Mitchell and Ravenhill’s 2013 extensions to an original quartet of songs by Benjamin Britten and Conor Mitchell. A much more jovial yet not always upbeat sequence of queer cabaret with soloist Nigel Richards dressing for the occasion (and showing off his glorious falsetto) and a guest spot for Ciara Mackey (seen recently as Lady of the Lake in Spamalot). A little more disjointed, it extended the evening, but lacked the intensity of the fear and furnaces of Ten Plagues.